Roméite Group: Mineral information, data and localities. The roméite group has its name after the generic name roméite which was first introduced in 1841 by Augustin Alexis Damour in honor of Jean Baptiste Louis Romé de L'Isle [August 26, 1736, Gray, Haute-Saône, France - July 3, 1790, Paris, France], the "father of crystallography". He was first an officer in the French Army and he developed the science of crystallography while he was a private curator for wealthy collectors of coins, minerals, etc. Sb-dominant members of the Pyrochlore Supergroup. The nomenclature was recently revised by Atencio et al. (2010); see also Christy & Atencio (2013). Mauzeliite Stibiconite Group . 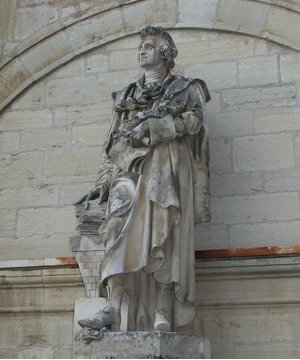 A Pb-bearing variety of "roméite." 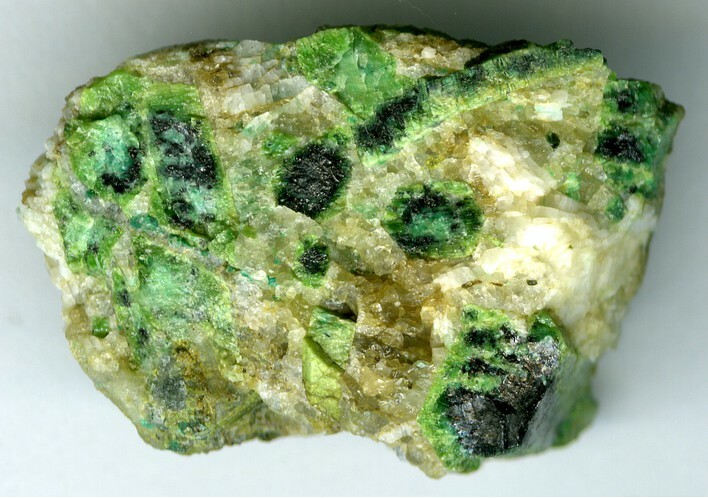 Originally reported from Jakobsberg Mine, Nordmark, Filipstad, Värmland, Sweden. Schneebergite (of Brezina) Stibiconite Group . An Fe-bearing variety of roméite. Weslienite Stibiconite Group . A F-bearing variety of "roméite" containing a considerable amount of fluorine in substitution for oxygen. Compare fluorcalcioroméite. Elsmoreite Group W-dominant members of the Pyrochlore Supergroup. Insoluble in acids. Decomposed by fusion with sodium carbonate. Damour, A. (1841) Annales des mines: 20: 247 (as Roméine). Brugger, J., Gieré, R., Graeser, S., and Meisser, N. (1997) The crystal chemistry of roméite. Contributions to Mineralogy & Petrology: 127: 136–146. Atencio, D., Andrade, M.B., Christy, A.G., Giere, R., and Kartashov, P.M. (2010) The pyrochlore supergroup of minerals: nomenclature. Canadian Mineralogist: 48: 673-698. Brik, M.G. & Srivastava, A.M. (2012): Pyrochlore structural chemistry: predicting the lattice constant by the ionic radii and electronegativities of the constituting ions. J. Am. Ceram. Soc. 95, 1454-1460. [var: Bismutostibiconite] Rankin, J., Lawrence, L.J., Sharpe, J.L., Williams, P.A. (2002) Rare secondary bismuth, tungsten and molybdenum minerals from Elsmore, New England district of New South Wales. Australian Journal of Mineralogy, 8:1, 55-60. [var: Bismutostibiconite] Sharpe, J.L., & Williams P.A. (2004) - Secondary bismuth and molybdenum minerals from Kingsgate, New England district of New South Wales.- Australian Journal of Mineralogy, vol.10, n°1. ⓘ Weißeck area (incl. Rauchkopf; Riedingscharte) ? [Cuproroméite] Steinwender, C., Kolitsch, U., Brandstätter, F., Niedermayr, G. (2012): 1756) Cinnabarit, Langit und Meneghinit aus Fahlerz-Vererzungen vom Weißeck im Lungau, Salzburg. Pp. 159-160 in Niedermayr, G. et al. (2012): Neue Mineralfunde aus Österreich LXI. Carinthia II, 202./122., 123-180. Meixner, H. (1951): Piemontit aus Osttirol und Romeit aus den Radstädter Tauern; eine Notiz zu tauernmetamorphen Manganvorkommen Osttirols und Salzburgs. N. Jb. Mineral Mh. 1951, 174-178. [Cuproroméite] http://www.franzbernhard.x10hosting.com/polishedslabs.html & Handbook of Mineralogy Vol III p427; Gerald Gesselbauer (06.2010); Ertl, A. & Branstätter, F. (2000): Über den „Protopartzit" bzw. „Thrombolith" aus dem Magnesitsteinbruch Veitsch, Sattlerkogel, Steiermark, Österreich. Joannea - Mineralogie, 1, 27-30. [Cuproroméite] Schnorrer, G. and Poeverlein, R. (2002) Schwaz-Brixlegg-Fundstellen: 2. Die Minerale des Stockerstollens bei Brixlegg in Tirol. Aufschluss, 53, 209-228. [Cuproroméite] Schnorrer, G. & Poeverlein, R. (2008): Schwaz-Brixlegger Fundstellen. 6. Die Minerale des Gratlspitz bei Brixlegg in Tirol. Aufschluss 59, 7-28. [Cuproroméite] Schnorrer, G. & Poeverlein, R. (2010): Schwaz-Brixlegger Fundstellen: 7. Die Minerale des Bergbaus Hofer Tratte bei Brixlegg in Tirol. Aufschluss 61, 147-156. [Cuproroméite] Putz, H. & Poeverlein, R. (2007): Die Mineralien des Gertraudstollens und seiner Halde in St. Gertraudi, Tirol. Lapis 32 (6), 58-63. [Fluorcalcioroméite] Kolitsch, U., Schachinger, T. & Auer, C. (2018): 2076) Aegirin, Aegirin-Augit, Albit, Baddeleyit, Baryt, Brandtit(? ), Braunit, Calcit, Canosioit, Clinosuenoit (ehemals „Manganocummingtonit“), Coelestin, Diaspor, Dolomit, Fluorapatit (As-haltig), Fluorcalcioroméit, Gamagarit, Hämatit, Hausmannit, Hjalmarit, Hollandit, Hydroxycalcioroméit, Klinochlor, Kutnohorit, Mischkristalle Manganiandrosit-(La) - Manganiakasakait-(La), Nambulit, Phlogopit, Piemontit, Pyrobelonit, Sb-haltiger Pyrophanit, Quarz, Ranciéit(? ), Rhodochrosit, Rhodonit, Richterit, Rutil, Spessartin, Talk, Thorit, Tremolit, Tilasit, Titanit, Tokyoit, Wakefieldit-(Ce), Wakefieldit-(Y), Zirkon, das Sb-Analogon von Hydroxymanganopyrochlor und unbenanntes LaAsO4 vom Obernberger Tribulaun, Nordtirol - ein erster Bericht über mineralogisch komplexe, linsenförmige metamorphe Manganvererzungen. Pp. 206-213 in Walter, F. et al. (2018): Neue Mineralfunde aus Österreich LXVII. Carinthia II, 208./128., 185-254. Palache, C., Berman, H., & Frondel, C. (1951), The System of Mineralogy of James Dwight Dana and Edward Salisbury Dana, Yale University 1837-1892, Volume II: 1022. Dajing Chen and Mingshou Yang (2000): Acta Geologica Sinica 74(3), 565-569.
ⓘ Uranium Mine No. 16 (Shaft No. 16) ? [Cuproroméite] Škácha P., Sejkora J., Litochleb J., Hofman P.: Výskyt cuprostibitu v příbramském uran-polymetalickém revíru (šachta 16, Příbram - Háje), Česká republika. Bulletin Mineralogicko-petrografického oddělení Národního muzea v Praze, 2009, roč. 17, č. 1, s. 73-78. Brugger, J., Gieré, R., Graeser, S., and Meisser, N. (1997): Contributions to Mineralogy and Petrology 127, 136-146. [Cuproroméite] P&T N°23-24, H. BARI 1982, Minéralogie des filons du Neuenberg à Sainte Marie aux Mines (Haut-Rhin). [Cuproroméite] "Giorgio Bortolozzi (visual identification)"
Fourcault, J. M. (1993): The alpine sulfosalt occurence at Saint Pons, Haute-Provence (France). Mineralogical Record, 24(1), 41-44. [Cuproroméite] Schnorrer, G. & Klänhardt, K. (2002): Die Minerale des Iberg-Winterberg-Massives bei Bad Grund/Harz. Aufschluss, 53 (4), 181-199; Jahn, S., K. Stedingk & K. Klänhardt (2012): Das Iberg-Winterberg-Massiv bei Bad Grund. Mineralien-Welt, 23 (4), 30-67. [Cuproroméite] J. Gröbner: Neufunde aus den Bergbaurevieren St. Andreasberg, Bad Lauterberg und von Oberschulenberg im Harz, MINERALIEN-WELT 18 (2007), 43-51. [Cuproroméite] Schnorrer, G. (2000): Mineralogische Notizen VII. Der Aufschluss, 51, 281-293. [Cuproroméite] Lapis, 14 (2), 22-27+33+42. [Cuproroméite] Lapis, 9 (5), 36-39. [Cuproroméite] Lapis, 9 (9), 31-38.
ⓘ Jean Baptiste Mine ? [var: Bismutostibiconite] Rieck, B., Kolitsch, U., Voudouris, P., Giester, G. and Tzeferis, P. (2018): Weitere Neufunde aus Lavrion, Griechenland. Mineralien-Welt 29 (5), 32-77 (in German). Palache, C., Berman, H., & Frondel, C. (1951), The System of Mineralogy of James Dwight Dana and Edward Salisbury Dana, Yale University 1837-1892, Volume II: 1021; Brugger, J., Gieré, R., Graeser, S., and Meisser, N. (1997): Contributions to Mineralogy and Petrology 127, 136-146. [Cuproroméite] Bortolozzi G,M., Ciriotti M.E., Bittarello E. and Moeckel S. (2015): Monte Avanza, Forni Avoltri; Carnia (Udine, Friuli-Venezia Giulia): conferme e nuovi ritrovamenti. Micro,1-2015, 2-39. 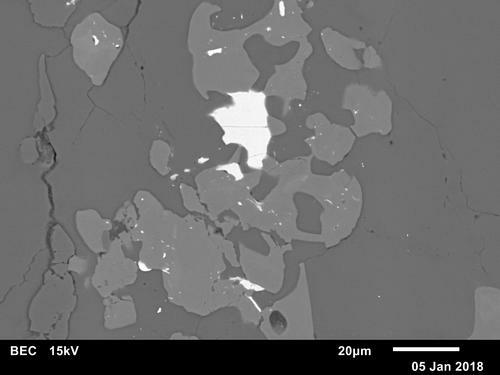 [Cuproroméite] - Bortolozzi G.M., Pondrelli M. e Vidus L. (2015) : I minerali della Creta di Timau (Lago Avostanis, Paluzza, Udine): riscoperta di un’antica località mineraria. Gortania, 37, 15-31. [Cuproroméite] Stara P., Rizzo R. and Tanca G.A. (1996): Iglesiente e Arburese. Miniere e mnerali. Vol. I, EMSa (Ente Minerale Sardo), pagg.238. [Cuproroméite] Stara, P., Rizzo, R., Tanca, G. A. (1996): Iglesiente – Arburese, Miniere e Minerali. Associazioni e Gruppi Mineralogici Italiani Ed., 238 pp. ⓘ Pira Inferida Yard ? [Cuproroméite] Brizzi, G., Olmi, F., Sabelli, C. (1994): Gli arseniati di Pira Inferida, Gonnofanadiga (CA). Rivista Mineralogica Italiana, 17, 3 (3-1994), 193-206. [Cuproroméite] - Sabelli C. (2000): Rooseveltite e "agardite-(Ce)".Riv. Mineral. Ital., 1/2000, 40-43. [Cuproroméite] Niedermayr, G. (2007): Die Bletterbach-Schlucht bei Radein (Redagno) - Eine Wanderung durch 50 Millionen Jahre Erdgeschichte. Mitt. Österr. Mineralog. Ges. 153, 181-193. Đorđević, T., Kolitsch, U., Tasev, G., Serafimovski, T. & Boev, B. (2017): Anomalous As-enrichment in gersdorffite in a realgar-rich environment: Lojane, Macedonia. Mitt. Österr. Mineral. Ges. 163, 38 (abs. ); Đorđević, T., Kolitsch, U., Tasev, G. & Serafimovski, T. (2018): First insights into the mineralogy of the tailings dump of the Lojane Sb-As(-Cr) deposit, FYR of Macedonia. Poster, EGU General Assembly 2018, Vienna, Austria, April 8-13; abstract in Geophysical Research Abstracts 20, 14914.; Kolitsch, U., Đorđević, T., Tasev, G., Serafimovski, T., Boev, I., Boev, B. (2018): Supergene mineralogy of the Lojane Sb-As-Cr deposit, Republic of Macedonia: Tracing the mobilization of toxic metals. Geologica Macedonica 32, 95-117. Sejkora S., Ozdín D., Vitáloš J., Tuček P., Ďuďa R., 2004: Schafarzikit von Pernek, Revier Pezinok (Slowakei). Lapis, 29, 12, 27-36.; Sejkora, J., Ozdín, D., Ďuďa, R. (2010): The supergene mineral association with brandholzite from Pernek, Malé Karpaty Mountains, Slovak Republic. Journal of Geosciences, 55 149-160. [Cuproroméite] J. Gröbner and M. A. Fernández Périz (2006): Minerals of the Copper-Cobalt Deposits Molvizar and Cerro Minado in Andalusia. Mineralup February 2006, 48-56. [Cuproroméite] J. Gröbner und B. Sainz de Barranda (1999): Die Mineralien der Kupfergrube bei Pardos in der Provinz Guadalajara, Spanien. Mineralien-Welt 10 (4), 26-31. (in German); Borja Sainz de Baranda, Joan Viñals (2007). La Mina "Estrella", Pardos (Guadalajara). Bocamina 19: 12-33; Borja Sainz de Baranda, Joan Viñals (2007). La Mina "Estrella", Pardos (Guadalajara). Bocamina 19: 12-33; Borja Sainz de Baranda y Joan Viñals (2007): La Mina "Estrella", Pardos (Guadalajara). Bocamina, 19: 12-33. (Kjell Gatedal)+ Grensman, F., Kalinowski, M.P. and Sandström, F. (2001): Garpenberg Norra. Litofilen. 18 (2), 26-46. [var: Atopite] Palache, C., Berman, H., & Frondel, C. (1951), The System of Mineralogy of James Dwight Dana and Edward Salisbury Dana, Yale University 1837-1892, Volume II: 1021. [var: Mauzeliite] Sjögren (1895) Geologiska Föreningens I Stockholm. Förhandlinger, Stockholm: 17: 313; Palache, C., Berman, H., & Frondel, C. (1951), The System of Mineralogy of James Dwight Dana and Edward Salisbury Dana, Yale University 1837-1892, Volume II: 1021..
Brugger, J., Cabalzar, W., Weibel, M. (1993): Romeit aus den Schweizer Alpen. Mineralienfreund 31(4), 1-7; Brugger, J., Gieré, R., Graeser, S., and Meisser, N. (1997): Contributions to Mineralogy and Petrology 127, 136-146. Brugger, J., Gieré, R., Graeser, S., and Meisser, N. (1997): Contributions to Mineralogy and Petrology 127, 136-146.; Brugger J. (1996): The Fe, Mn, (V, Sb, As, Be, W) deposits of Val Ferrera (Graubünden, Switzerland). Unpublished PhD Thesis, Univ. Basel. 188 p.; Brugger, J., Berlepsch, P. (1997) Johninnesite Na2(Mn)9(Mn,Mg)7(AsO4)2(Si6O17)2(OH)8: a new occurrence in Val Ferrera (Graubünden, Switzerland): Schweiz. Mineral. Petrogr. Mitt., 77, 449-455. Brugger, J., Gieré, R., Graeser, S., and Meisser, N. (1997): Contributions to Mineralogy and Petrology 127, 136-146.; Brugger J. (1996): The Fe, Mn, (V, Sb, As, Be, W) deposits of Val Ferrera (Graubünden, Switzerland). Unpublished PhD Thesis, Univ. Basel. 188 p.
[Cuproroméite] Gröbner J. (2018): Die Mineralien der Kupferlagerstätte Ursera bei Andeer im Schams - Ein Exkursionsbericht. Bergknappe 133(2), 5-10. [Cuproroméite] Cuchet, S., Ansermet, S. & Meisser, N. (2012): Die kupferhaltige Mineralisierung am Six Blanc im Wallis. Schweizer Strahler 46 (4), 2-16 (in German and French). [Cuproroméite] Arents (1867); Mineralogical Magazine (1953): 30: 100, 362; Pemberton, H. Earl (1983), Minerals of California; Van Nostrand Reinholt Press: 184. [var: Bismutostibiconite] Mineralogical Record (1998): 29: 165. [Cuproroméite] Dunning, G.E., Cooper, J.F. (2005) Mineralogy of the Spring Creek area, Last Chance mining district, Plumas County, California. Axis: 1: 1-30. [Cuproroméite] Minerals of Colorado (1997) Eckel, E. B.
NBMG Spec. Pub. 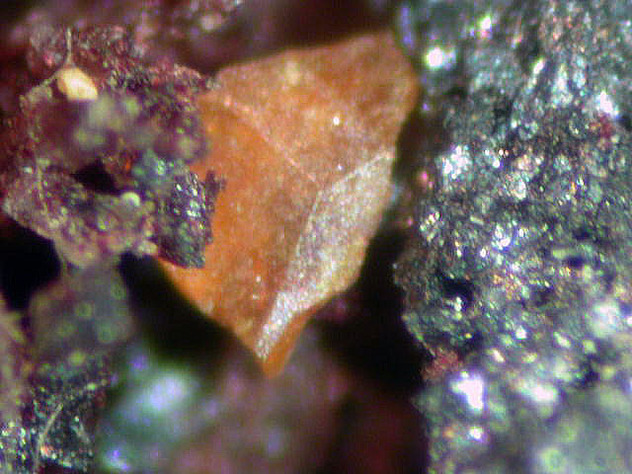 31 Minerals of Nevada; Schumer, B. N. (2012). Origins and Evolution of the Green Prospect Antimony Deposit, Churchill County, Nevada. Masters thesis University of Nevada, Reno. Dunn, P.J. & Leavens, P.B. : American Mineralogist (1980): 65: 196-199; Dunn, P.J., et al (1980): American Mineralogist: 65: 1143-1145; Dunn, Pete J. (1995): Franklin and Sterling Hill New Jersey: the world’s most magnificent mineral deposits, part 4: 604.